Delft ([dɛlft] ( listen)) is a city and municipality in the province of South Holland, Netherlands. It is located between Rotterdam, to the southeast, and The Hague, to the northwest. Together with them, it is part of both Rotterdam–The Hague metropolitan area and the Randstad. Delft is a popular tourist attraction in the country. It is home to Delft University of Technology (TU Delft), regarded as center of technological research and development in the Netherlands, Delft Blue pottery and the currently reigning House of Orange-Nassau. Historically, Delft played a highly influential role in the Dutch Golden Age. Delft has a special place in the history of microbiology. In terms of science and technology, thanks to the pioneering contributions of Antonie van Leeuwenhoek and Martinus Beijerinck, Delft can be considered to be the true birthplace of microbiology, with its several sub-disciplines such as bacteriology, protozoology, and virology. The city of Delft came into being beside a canal, the 'Delf', which comes from the word delven, meaning delving or digging, and led to the name Delft. It presumably started around the 11th century as a landlord court. 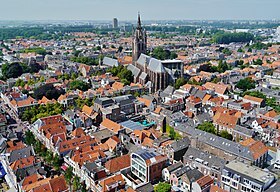 From a rural village in the early Middle Ages, Delft developed into a city, that in the 13th century (1246) received its charter. (For some more information about the early development, see Gracht). When William was shot dead in 1584 by Balthazar Gerards in the hall of the Prinsenhof, the family's traditional burial place in Breda was still in the hands of the Spanish. Therefore, he was buried in the Delft Nieuwe Kerk (New Church), starting a tradition for the House of Orange that has continued to the present day. The Delft Explosion, also known in history as the Delft Thunderclap [nl], occurred on 12 October 1654  when a gunpowder store exploded, destroying much of the city. Over a hundred people were killed and thousands were wounded. Today, the explosion is remembered primarily for killing Rembrandt's most promising pupil, Carel Fabritius, and destroying almost all his works. The city centre retains a large number of monumental buildings, while in many streets there are canals of which the banks are connected by typical bridges, altogether making this city a notable tourist destination. Nieuwe Kerk (New Church), constructed between 1381 and 1496. It contains the Dutch royal family's burial vault which, between funerals, is sealed with a 5,000 kg (11,023 lb) cover stone. A statue of Hugo Grotius created by Franciscus Leonardus Stracké in 1886, located on the Markt near the Nieuwe Kerk. The Vermeer Centre in the re-built Guild house of St. Luke. The painter Johannes Vermeer (1632–1675) was born in Delft. Vermeer used Delft streets and home interiors as the subject or background in his paintings. Several other famous painters lived and worked in Delft at that time, such as Pieter de Hoogh, Carel Fabritius, Nicolaes Maes, Gerard Houckgeest and Hendrick Cornelisz. van Vliet. They were all members of the Delft School. The Delft School is known for its images of domestic life, views of households, church interiors, courtyards, squares and the streets of Delft. The painters also produced pictures showing historic events, flowers, portraits for patrons and the court as well as decorative pieces of art. Delft supports creative arts companies. From 2001 the Bacinol [nl], a building that had been disused since 1951, began to house small companies in the creative arts sector. However, demolition of the building started in December 2009, making way for the construction of the new railway tunnel in Delft. The occupants of the building, as well as the name 'Bacinol', moved to another building in the city. The name Bacinol relates to Dutch penicillin research during WWII. Delft University of Technology (TU Delft) is one of four universities of technology in the Netherlands. It was founded as an academy for civil engineering in 1842 by King William II. Today well over 21,000 students are enrolled. retail; (IKEA (Inter IKEA Systems B.V., owner and worldwide franchisor of the IKEA Concept, is based in Delft), Makro, Eneco Energy NV). Inside the city, apart from a central park, there are also several smaller town parks, like "Nieuwe Plantage", "Agnetapark", "Kalverbos" and others. Furthermore, there is the Botanical Garden of the TU and an arboretum in Delftse Hout. Hugo Grotius, a founding father of modern international law. 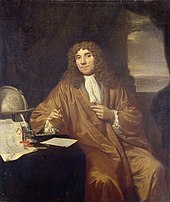 Antonie van Leeuwenhoek, the first acknowledged microscopist and microbiologist. He is commonly known as the father of microbiology. Martinus Beijerinck, the founding father of the Delft School of Microbiology. He is often considered as one of the founders of virology, environmental microbiology, and industrial microbiology. Nuna is a series of manned solar-powered vehicles, built by students at the Delft University of Technology, that won the World solar challenge in Australia seven times in the last nine competitions (in 2001, 2003, 2005, 2007, 2013, 2015 and 2017). Members of both Delft Student Rowing Clubs Proteus-Eretes and Laga have won many international trophies, including Olympic medals, in the past. The Human Power Team Delft & Amsterdam, a team consisting mainly of students from the Delft University of Technology, has won The World Human Powered Speed Challenge (WHPSC) four times. This is an international contest for recumbents in the US state of Nevada, the aim of which is to break speed records. They set the world record of 133.78 kliometres an hour (83.13 mph) in 2013. Delft's longstanding connection with Rishon LeZion ended in 2016 after the supporting organizations shut down in both countries. Topographic map of Delft city (in Dutch), September 2014. Click to enlarge. Trains stopping at these stations connect Delft with, among others, the nearby cities of Rotterdam and The Hague, up to every five minutes, for most of the day. There are several bus routes from Delft to similar destinations. Trams frequently travel between Delft and The Hague via special double tracks crossing the city. One of those two lines (19) is still under construction inside Delft and is meant to connect The Hague with a science park, which is being developed on the southern (Rotterdam) side of Delft and is a joint project by the Delft and Rotterdam municipalities. ^ "Maak kennis met..." [Meet...]. Burgermeester Verkerk (in Dutch). Gemeente Delft. Archived from the original on 18 July 2013. Retrieved 18 July 2013. ^ "Postcodetool for 2611GX". Actueel Hoogtebestand Nederland (in Dutch). Het Waterschapshuis. Retrieved 18 July 2013. ^ Artenstein, Andrew W.: The discovery of viruses: advancing science and medicine by challenging dogma. (International Journal of Infectious Diseases, Volume 16, Issue 7, July 2012, pages: e470-e473). doi:10.1016/j.ijid.2012.03.005. Andrew W. Artenstein: "By 1895 Beijerinck had returned to academia after leaving the Agricultural School for a 10-year stint in industrial microbiology in Delft, the South Holland birthplace of van Leeuwenhoek, one of the founding fathers of microbiology. During his first years at the Technical University of Delft, Beijerinck resumed the research on tobacco mosaic disease that he had started while working with Mayer. Even then, he had appreciated that the affliction was microbial in nature, although he felt that the actual agents had yet to be discovered. Beijerinck's investigations at Delft proved fruitful; he not only confirmed the infectivity of the contagium vivum fluidum—soluble living germ—despite filtration, but he importantly demonstrated that unlike bacteria, the culprit of tobacco disease of plants was incapable of independent growth, requiring the presence of living, dividing host cells in order to replicate." ^ a b c d Martin Dunford (2010). The Rough Guide to The Netherlands. Penguin. p. 169. ISBN 978-1-84836-882-8. Retrieved 24 November 2011. ^ "Delft, Zuid-Holland" (in Dutch). Molendatabase. Retrieved 22 October 2014. ^ "Category:Delftse Hout". Retrieved 6 May 2015. ^ "World Solar Challenge 2017". worldsolarchallenge.org. ^ "The Recumbent Bicycle and Human Powered Vehicle Information Center". recumbents.com. ^ "List of Twin Towns in the Ruhr District" (PDF). © 2009 www.twins2010.com. Archived from the original (PDF) on 2009-11-28. Retrieved 2009-10-28. ^ "Onthulling gedenksteen Rishon LeZion". Heerenveense Courant. ^ "Category:Spoorzone-project". Retrieved 6 May 2015. ^ "Nieuwe tram -en buslijnen" [New tram and bus lines]. Traffic and Transit (in Dutch). Haaglanden Urban Regio. Archived from the original on 22 May 2013. Retrieved 16 March 2013.